Join staff and students at the Centre for Mathematical Sciences on Saturday 23 March 2019, 12 noon-4pm, to share the excitement of the subject through hands-on activities, games and demonstrations (featuring everything from prime numbers to paper folding, and custard to cosmology!) for visitors of all ages from 8 through to adult. From Isaac Newton onwards, Cambridge has been associated with some of the most famous mathematicians in history. Modern mathematicians and theoretical physicists work on everything from the Big Bang to number theory, from geometry to image processing in art and medicine. This family event includes hands-on activities, demonstrations and games led by more than 75 volunteer staff and students from the Mathematics Faculty. Join us to discover more about the huge range and diversity of mathematics and theoretical physics. Develop your mathematical thinking and imagination with engaging hands-on games from NRICH, learn more about the fabric of spacetime with Stephen Hawking's research group, and use the interactive photobooth to investigate how maths can improve medical imaging - and machine learning can give you a personalised Van Gogh - in the Cambridge Image Analysis pop-up lab. Explore inside the fluids dynamics laboratory hidden beneath the lawn of one of the most beautiful modern buildings in Cambridge to discover more about what Cambridge applied mathematicians do, and try for yourself with our hands-on fluids activities and demonstrations! There will also be a very rare opportunity to take a tour round the COSMOS supercomputer, which supports research in cosmology, astrophysics and particle physics. Places for the tours, which will be run at intervals during the afternoon, can only be booked in person on the day (the tours will run at 1pm, 2pm and 3pm - please note numbers are very limited). 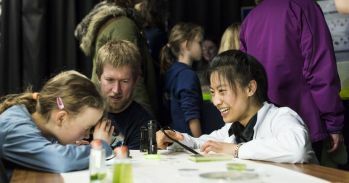 This free event is part of the 2019 Cambridge Science Festival. No booking needed - drop in throughout the afternoon (12 noon - 4pm). The Maths Cafe will be open from 12 until 4, serving tea and coffee, soft drinks, sandwiches and snacks. Find directions and a site map of the Centre for Mathematical Sciences here. Some limited on-site free car parking will be available in the CMS car park, accessible from Wilberforce Road, between 12 noon - 4pm.